ESD safe dispenser is made of anti-static HDPE material, They are widely used in cleanroom or electronic manufacturering industry. Features： ▪ Material: anti-static HDPE material; Color:Blue; or Yellow ▪ Volume: 500ml, 250ml, 60ml ▪ Surface resistance: 10e7-10e9ohms ▪ There are three types of lid for option: spray bottle type, squeeze bottle type and suction bottle type. The bottle body is the same. Application: the first two solvent bottles are used in the electrostatic sensitive area, and the latter is used in the absorber of staff in the electrostatic area. Such as precision electronics, laboratory, communication information, aerospace and other industries a large number of applications. ▪ Good anti-static performance, work safety standard, improve work efficiency, and effectively protect products and staff. ▪ Packing: each OPP bag is individually packed, and the box is 53*40*40cm. ▪ Good quality, affordable price, and repeated orders from domestic and foreign traders. 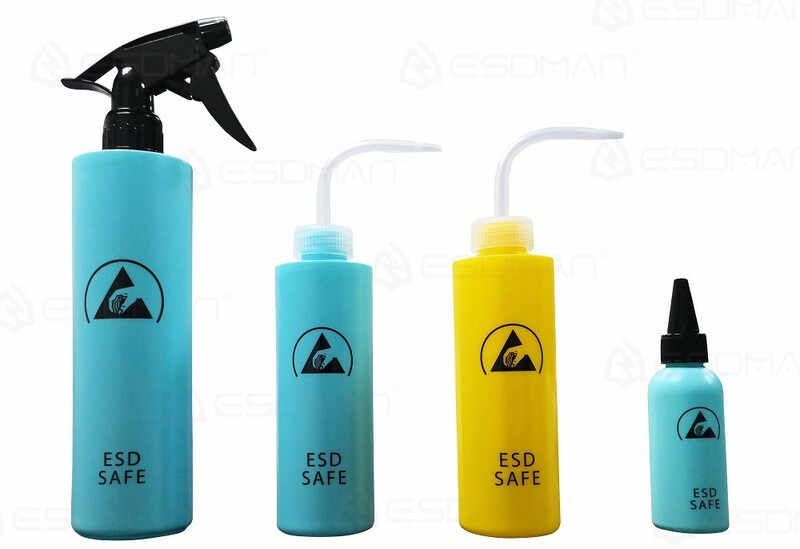 ESD safe dispenser is made of anti-static HDPE material, They are widely used in cleanroom or electronic manufacturering industry. ▪ There are three types of lid for option: spray bottle type, squeeze bottle type and suction bottle type. The bottle body is the same. Application: the first two solvent bottles are used in the electrostatic sensitive area, and the latter is used in the absorber of staff in the electrostatic area. Such as precision electronics, laboratory, communication information, aerospace and other industries a large number of applications. ▪ Good anti-static performance, work safety standard, improve work efficiency, and effectively protect products and staff. ▪ Packing: each OPP bag is individually packed, and the box is 53*40*40cm. ▪ Good quality, affordable price, and repeated orders from domestic and foreign traders.